AO Auxiliary member Brandy Vencel (AfterThoughts) has some tips with videos to help you create blank weekly chart templates and weekly schedules. AO Auxiliary member, Kathy Livingstone, has compiled all of her scheduling posts in one place on her blog, including explanations of how she scheduled Years 3, 5, 7 and 10 one year. One AO Advisory member likes to plan the entire year out into daily increments; you can see many of her schedules here. I have a 6 year old in Year 1, a 4 year old, and a 19 month old. We used to do almost all of our school work while the youngest one was taking her morning nap. The 4 year old just hangs out with us and does arts and crafts that she can manage alone or prewriting and math activities so that she feels like she is "doing school". Sometimes she gets bored and goes to play in her room. With spring weather and an older toddler who only takes one nap, our schedule is in flux right now. I break the reading up throughout the week. Last week's schedule was for week 26. On Monday, I read 2 Aesop Tales. On Tuesday, I read Lang (East of the Sun, West of the Moon). On Wednesday, I read Viking Tales (The Baby). On Thursday, I read one chapter from the Bird book. Well, I was supposed to read the bird book, but we got busy with other stuff. I'll add that to next week's schedule. I read the Bible everyday and two poems everyday. We dropped Seabird because it is now on the Year 2 schedule, and I dropped Parables from Nature because I couldn't stand it. Sorry. Week 26 worked out to be a light week for reading, but you can see how we break it up. I don't follow a formal schedule for how it gets broken up, I just try to evenly distribute it and give myself a light day if we are busy with something. We usually do some copywork, read, do some math, read, do some phonics, read, etc. Sometimes I read to them during lunch since they have to be still and sort of quiet to eat anyway. I do the free reading at night before they go to bed. They don't even think of that as part of school; they just think it is their nightly story like they've always had. When the weather's nice, we sometimes go outside and sit in their play structure to read. Break that reading up throughout your week and your day, and it won't feel like such a large amount. Read the Bible over breakfast, read Viking Tales while you are waiting for an appointment, read poetry during lunch or snack. Read while your youngest is napping or after he (she?) goes to bed if your youngest goes to bed before the oldest. Remember that you can school year round and just stretch the reading out for more of the school year and read less in each week. I have an utterly undependable back - and during my last pregnancy four years ago a painful, but otherwise not dangerous, complication meant I was not to be on my feet more than 20 minutes at a time, and doing the grocery shopping or driving the van literally had me in so much pain that sweat would pour off of my hands. So while my circumstances are different, I do have some experience with chronic pain and trying to homeschool. How to handle it will depend largely on the maturity and work habits and age of your children. What I did was make up a schedule that the children were supposed to work at independently, regardless of my involvment. Well, we had mixed results. My teens did fine. One of my middle children learned habits of indolence, poor attention to detail, and laziness. She would have been better off if I had just allowed her to read good books and play on my bad days. If I were in the same circumstances again, I would make sure there was no tv, limited videos, plenty of high quality literature, music, and art supplies around, and would only do school on days I could oversee to ensure that lazy habits did not take firm root. I might assign the teens to do math flash cards or something with the younger siblings to keep their skills up. I'm struggling to fit all the Year 4 things I want to do into a schedule; I've used up a whole lot of notebook paper on this one and I think I know how it will work; but maybe I should wait before we actually get into the school year before sharing in case it's a disaster. Every year brings something a little bit different; this year it's a new baby to deal with, plus our just-turning-four dd wants more "kindergarten time", plus our oldest dd is just transitioning into Year 4 work with harder reading, new subjects, more writing, and she's going to need more time as well. However, I'm still going to try to be done with the major work before noon, except for independent reading (the supplementary lists) for half an hour, some music practice, and a list of approved projects and activities that I'm hoping will fill out at least some of the afternoon time. I'll lay out here what I'm planning, although it would be easier to understand in chart form. Every morning, everyone, at 8:30: prayer, hymns, catechism. Bible study every day except Wednesday when we're going to read Madam How. From 9-9:30 the older dd will be doing math and Wordly Wise exercises. Once a week she'll be reading The Incredible Journey, and on Fridays, a book of short biographies (that's our Citizenship this term). This is second dd's kindergarten time. From 9:30-10 we have something different every day, plus Latin work: Age of Fable, science and nature, keyboard lesson, English grammar, map drills, and Friday Math which is going to be a little different from the rest of the week--more real-life problems and thinking skills. 10:30-11:10 will be different every day: memory work plus geography, history, literature, poetry, dictation, Shakespeare. From 11:10-11:30, assuming we're still hanging in there, will be French 3x/wk, with composers and picture study the other days. And then lunch and all those other things. Looking forward to the year ahead, Anne W.
When I work out a schedule I first figure out how many pages will need to be covered in one term by dividing a the page numbers of one book by three. Obviously, if we're only going to read a book in one term, I don't have to do this step. For example, The Magna Charta, by James Daugherty (reprinted by Bethlehem Books) is to be read only in term two, so skip the first step. But Janson's Story of Painting is for all three terms (unless we choose Van Loon's The Arts instead), so I divide the pages (173, skipping the index) by 3, and come up with roughly 58 pages per term. I divide these numbers by the weeks in a term, which means we'd need to read roughly 12 pages of The Magna Charta each week of term 2, and in the neighborhood of 5-6 pages each week in all three terms in Janson's. I do this for each book in a term, writing down the book and subject in a column on the left side of a page. Cleverer people than I no doubt could do this on a computer. I do it by hand. =) Next, I write the days of the week we do school across the top of the page. Now I run my eye down the column to the left, figure out how many times a week we'd need to read that book to get that many pages read without overload, and place an x under the appropriate days of the week. Keep the writing style of the book in mind, too. The Magna Charta, for example, is fairly easy reading. Just to test it, I just timed myself reading pages 1-6. It took exactly two minutes. So you could have the Magna Charta reading just once a week, or maybe twice. Pick which two days, place an x to the write of where you've written Magna Charta by Daugherty, and just under the days you've chosen. Janson's is a little more difficult, but it's also lavishly illustrated. That means that five pages really has only about three pages of text, the other two are paintings. But still, we want the student to linger over it a bit, think and consider, so I'd probably give Janson's two days a week, too, reading 3 pages one day, 2 another. It's up to you whether you do this back to back or have one reading on Mon and one on Fri.
As you continue plugging in your x's representing which readings you'll do on which day, you can cast an eye over the schedule as a whole, trying to make sure you don't load all the history on one day and all the science on another. This is slightly laborious, but it is not rocket science. Don't sweat it. There is no perfect schedule, or if there is, life interferes and makes it unperfect. =) Your child will not be ruined for life if you accidently schedule a page too few or too many, or if you do not have some magically perfect, formulaic mix of subjects. Once you have your list, you work out the daily schedules - again trying to keep an eye over the broader picture so that two difficult readings do not go back to back, but subjects are broken by different types of work (the songs, for example, might go well right after or right before a reading of Malory). Carol H. posted her son's Year 8 schedule on a webpage so he could access it himsef. You can see it here. Everybody comes up with their own way of scheduling, this is how I do it. I spend a day before each term planning out my weekly schedule on the computer. I have three children, all boys, Years 5, 1-2 and K-1 (I haven't decided exactly where the two younger ones are, and I plan to officially start them in Year 1 at the same time) I don't have toddlers or babies; I know that those who do usually try to plan blocks of time that their children need one-on-one for the baby's naptime. I try to plan the one-on-one things together, and do those first, so that their individual work is done last. That way, if they dawdle, I'm not waiting for them. We'll be adding Latin this year. We use the extra literature books posted as suggestions for our bedtime read alouds. Theoretically, our schoolday is 3 hours 10 minutes - 4 hours. I like to be done by lunchtime, but that's hard when I don't even get out of bed til 9. I paste this into a Word document 12 times (for my 12-week term) and then I look at the AmblesideOnline 36-week schedule and start filling in my document with specific AmblesideOnline assignments and pages. I print out two copies - one for me, one for my oldest son so he can work as independently as possible. 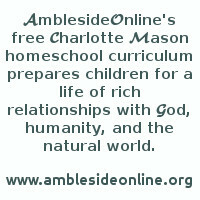 All of my children who are able to read do most of their work independently using AmblesideOnline years or a variation that I have made using AmblesideOnline as a model. They are 14, 12, 11 and 9. The key for me has been to choose books that they are able to read for themselves and give them each their own schedule. With 6 students this year, there is no way I have time to read everyone their books. I found it was not beneficial to try to keep everyone together. Either my younger ones didn't comprehend the books or my olders were not being pressed toward improving their abilities. I spend 20-30 minutes each with all of my readers every day listening to narrations from those that can't write them, checking their work, helping with a math problem, etc. Many times they do not even need this much time with me. We spend one hour daily doing some subjects together as a family (ie. Nature Study, Artist and Composer study, Shakespeare stories, etc.). This leaves me the time I need (about an hour and a half) with my 2 non-readers, ages 7 & 5. So be encouraged! If they can read, it is possible for them to work independently. This has been my goal. Not because I'm lazy and don't want to do the work (I actually love it!) but because I believe it is best for them to learn to "use the books for themselves". The authors are the teachers. My job is to introduce them and let them get to know their instructor. Here is our family schedule for 6 school age children (and 1 baby). - 7, Abel - 5, and Annalise - 1. AmblesideOnline Reading - 20 min. and so on.... We read one of these a day. **Tree in the Trail by Holling C. Holling ***Seabird by Holling C.
Foreign Language (Sign/ Misc. Children's songs in asst. Lunch is on paper plates and is almost always sandwiches or quick leftovers with fruit. Certain of the four children are in charge of cleanup for each meal. School is an all day affair with us. If interrupted by younger siblings, we stop and nurture the interruptor for a while and continue school afterwards. If that doesn't work, one of the older ones is put on "Jesse Duty" while the rest of us finish the lesson. But another thing my husband set up was moving our baker's rack to the garage and filling it with activity boxes for the young ones. Each day, my four year old gets to choose a box to occupy himself while we "do" school. There are duplos, leggos, lincoln logs, wood blocks, little plastic animals, play-doh, etc. inside the boxes. He is also old enough to use simple cd roms and watch certain acceptable videos. (I abused the video idea when my other son was young and he's totally unmotivated for school, so I would go easy on the tv thing while they're preschoolers. Just my opinion...) Also, when the kids were all so young, sometimes I set one up at the sink doing plastic dishes while I read to the older ones. This one lasted for an hour or so. He loved the warm, soapy water! A friend of mine told me to spend thirty minutes with my toddler before school starts and the whole day will be different. Give the young one your first hour and he/she will feel he's had the attention he desired and then be more willing to retire to the activity box chosen. I tried it, and it helped. Problem one is a baby - people say school when baby naps, but . . . I got used to schooling with the sounds of a baby in my lap, playpen, crawling around, etc. The activity box worked well with the toddlers, too. A friend once told me that the best homeschooling year she had was when she broke her leg and could only sit and read aloud with the kids. Don't worry if it seems nothing is being accomplished. It may be a year of readjustment and readalouds, but it's training them for the next year of study. And next year the baby will be that much older and (hopefully) more manageable. > baby books/albums finished, etc....and find that VERY discouraging. My friend's sons went to a private school and she showed me a schedule similar to this (but with all ABEKA:-) that her son worked from each week. It seemed like something that would work for me. I need it all down there, on ONE sheet. I will admit that it took me quite a few hours to finish all 36 weeks, but now I'm done for the year, and I have a very clear picture of how the year will unfold. Since my daughter is doing year three, she can do most of it herself, and she's responsible for checking off the boxes. In the morning I do math and Latin with her. Then she goes to her room, shuts the door, and does spelling, copywork, poetry and Bible reading, etc. After lunch when my two littler ones are down, I will usually do one of the readings with her, mostly because I want to fill in those gaps in my own education. If she reads them herself she comes back to narrate to me. I'm not going crazy anymore because I'm not carrying around a mental notebook of all those things I'm supposed to remember. It's actually not hard to put together if you take the 36-week schedule in the files, and paste it in. What worked the best for me was to do one week of the term, adding in all the extras, and then copy the entire thing for the next week and just change the page numbers, or add in extra books as were supposed to come in. If you're wanting to schedule in recommended books as well as those already in the official schedule, it really helps to have them there in front of you, so you can see how long the chapters or assignments really are. After I finished the 36 weekly schedules, I put them in a massive tabbed notebook. Behind each week went the schedule, copywork for the week (done on StartWrite software), the notebook paper for the copywork (no more excuses) and the weekly selection from Kingsley's Heroes. Each week we'll take the weekly section out of the big binder and transfer it into a smaller one, which dd keeps. At the back of this one goes the term's memory work assignments, lyrics to the folksongs, and Angela Zimmerman's art prints, all in page protectors. At the front is a plastic zip pocket with pens and pencils (again, to eliminate excuses). There are also pockets for her to file the week's written assigments. I don't know if this could realistically work for someone who had a lot of children in school to schedule. Only one of my three is in school yet. Also, if you can keep it all straight, I wouldn't recommend going to all this trouble--just use the looser schedule in the files. (Thank you, thank you, thank you to all who put that together!!) But there may be some others out there like me who have to have the ducks in a row....or you keep finding them sneaking off to the pond! [ ] Rainbow Book of Nature, pg 11-17 Come out and Look! School is broken up into 2 major sections - work the child does independently, and work the child does with me. We do 30 minutes Bible 4 days/week for the 10ds and 12dd. 6ds and I read Bible stories during our 1-on-1 time. One lesson, done independently by the child... then I check their work and help them with problems during our 1-on-1 time. (6ds does math with me). Nature Walk/Study - 20 min We have enjoyed this more since I started reading Tracking type of books aloud - now even 6ds finds animal tracks whenever we are hiking - which I hope will lead to more acute observations in other areas. Reading - 30 min Copywork - 15 min Poetry - 10 min Spelling and Grammar - 35 min? Copywork, spelling and grammar are lumped together with memory work - whatever I have them memorizing, they are also using as their current copywork piece, and using the words contained therein as their spelling words. Grammar is learned from reading quality literature, plus is incorporated into their Homeschool Greek lessons. Poetry is going to be started with my 12dd this year (I'm not a poetry enthusiast, sigh). Right now (lol) the poetry plan is for her to read 2 Shakespeare sonnets/week and do expressive readings at dinner of same sonnets (we are doing Renaissance Literature this year). We actually take a long (2 hr) lunch break... and after lunch we work as a team and do that day's housework. This gets the blood flowing and gives us a good break from school. Tuesday: Living room, dining room, kitchen. Vacuum house & office. Saturday: Prep grocery list for next week. Linoleum surfaces. We do French during our 1-on-1 time. Only on Wednesdays. Length of time depends upon what we're doing... ceramics can take 1/2 the day. I have found that if I give specific assignments instead of a time limit, my kids focus more to get the 'job' done. I think they are task oriented instead of time oriented... if I asked my 10ds to read for 30 minutes, he thinks he's dying. However, if I ask him to read X number of pages, or 1 chapter, or whatever, he cheerfully goes to it, even if it takes him 30 minutes! This also applies to other classes... I give a definite, brief assignment that they can focus on, and they do that assignment daily (M,T,Th,F) until either I change the assignment; they finish the book, or program, or whatever; or they have problems with the assignment and come to me to negotiate. Here is what I'm planning. I plan on teaching 4 days a week. Friday would be free days to catch up (if necessary). I have a Y2 and a Y3 student plus my daughter (age 6) who I will do a modified Y1. She won't be doing history. I don't think she's ready for it as she JUST turned 6. I still have to add Latin for my oldest son, but that probably won't be until after Christmas. My Y1 daughter wants to learn ASL so I may do that with all my children.